Sea Solve is a water-based, non-hazardous, biodegradable solution for your boat that dissolves, releases, and removes salt ions from any hard surface exposed to salt: Wood, metal, fiberglass, rubber, plastic, chrome, glass and more. A one liter bottle will clean approximately 200 feet of boat, removing salt for a spot free surface. 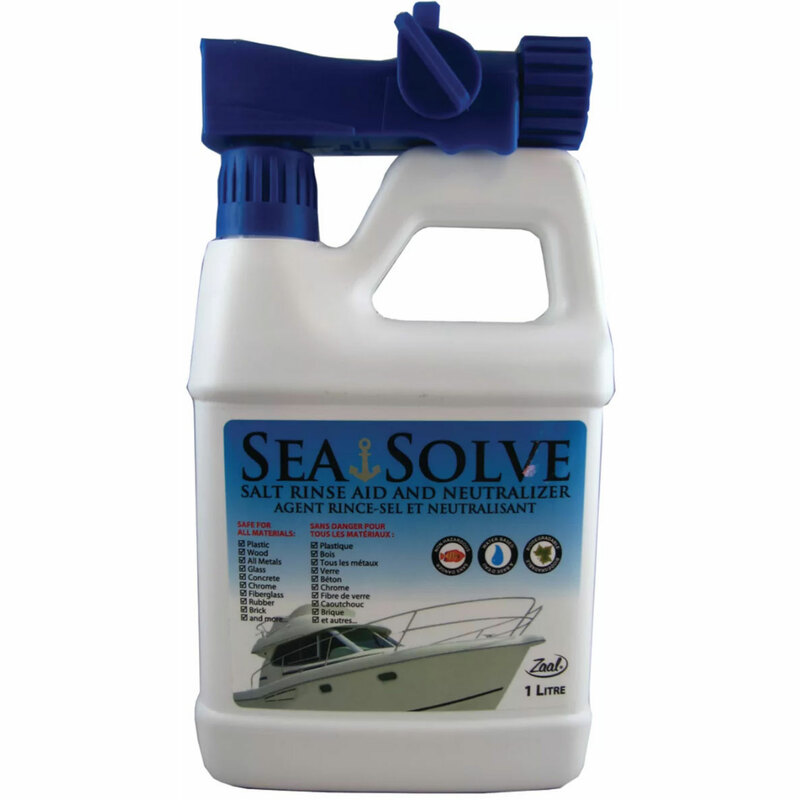 Sea Solve will brighten and toughen bare teak and eliminates the need for multiple rinses to remove soot and salts. This saves you time and water. Safe to use on all metals, fiberglass, rubber, plastic, chrome, glass, concrete; any hard surface exposed to salt. One Liter Size bottle has blue adapter nozzle with foaming dispenser and rinse mode for use on your garden hose. Adapter gives 1 to 200 parts water mix so the 1 liter makes 200 liters. Wet surfaces in the rinse mode, then in the wash mode from top to bottom soak area and let sit for 1 to 10 minutes finally rinse with fresh clean water for a no streak shine. For smaller jobs premix 1 to 30 in a spray bottle, wet surfaces, spray mixture on surface, brush in crevasses and rinse. For small parts dip use 1 to 2 mix. Let parts soak over night, brush and rinse. Remove any major salt buildups, grease or dirt; by first rinsing with water and/or a de-greaser. Flushing your outboard engine is best done in an garbage can with the leg immersed in the water with a mix of 1 to 100 parts water and run for an hour. On coolant exchangers add to the raw water side 1 to 100 parts mix and let sit over night or if covers are off. Spray concentrate several times on the build up over a period of time to dissolve. Rinse with water when finished. Pressure Washers can be set to meter, a to 1 to 200 mix follow same procedure.